As I’ve mentioned, Frequency is one of several time travel series on the air right now. Last night, Timeless’ Abigail Spencer tweeted, “Anybody wanna come get in my time machine?” Steeped in Frequency, I’ve been thinking a lot about why this possibility of tweaking the past as so popular. Even before the horrific results of last night’s election. If you had Timeless’ time machine or Raimy’s radio, what would you tell someone in the past to try to do? Cancel The Apprentice? So it’s no wonder that the thought of being able to fix things up in the past has such appeal. From a narrative standpoint, it’s also rich, because said past-tweaker expects things to go a certain way when they clean something up in the timeline. As The Flash’s Barry Allen can tell us (many times over), things seldom work out the way this person planned. 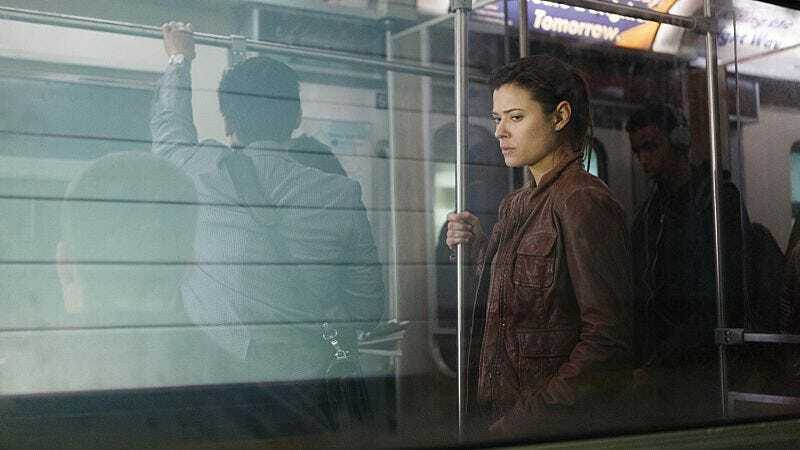 Which leads us to Frank and Raimy’s current frustration in this episode of Frequency, as they fruitlessly search for the Nightingale, who seems to have his own ticket into the future, since he’s always a step or two ahead. The presence of Karl (Curtis Armstrong) even opens up that possibility. Karl appears to be Frank to his own future Raimy, who has now painted himself into a Minority Report or Early Edition situation, where he tasks himself to prevent horrific events before they happen. Without Karl’s communication device, we don’t know if he’s crazy or not. But it’s nice to at least give Raimy someone else to talk to about how the events of the past affect the future, and vice versa. In the end, it looks like strapped-in Karl is only nuts, but is he? And if he is, what does that say about Raimy? I like Karl’s tree sketch explaining why almost everything Frank and Raimy try to do goes awry. Yes, Angela had 20 extra and apparently lovely years (oh, everybody’s life looks perfect on Facebook), but the Nightingale got her eventually. But the fact that the Nightingale hung on to Frank’s picture for just as long implies that he’s no stranger to this time-travel conundrum himself. And the taunt of that picture, combined with the looped Raimy video, implies that even she might be next on his list. Which makes it even more unlikely that Frank would really be so aghast at killing the Nightingale, the man who kills his wife. Even Raimy gets that the main thing that Karl says that makes sense is that they have to “cut off the trunk,” or kill the Nightingale in 1996 so that he can’t continue to harm women for two more decades. I’m pretty much a pacifist, and even I’m like, “Sure, that makes sense.” Frank has been a conflicted character since we met him: first as a dirty cop, then as a good guy. This episode he serves as a knight in shining armor to not only Angela but Julie, protecting her at night. So the ending revelation from Stan that Frank had an affair while undercover is undoubtedly meant to be jarring. But we’ve already built up so much goodwill for Frank that it doesn’t matter much, except to throw another complication in with his relationship with Julie. Raimy has her own love troubles, but it’s kind of nice how the “kismet” she refers to with Daniel offers the positive opposite to the Nightingale investigation’s many dead ends. If some bad things are inevitable, like Angela’s death, maybe some good things are too? Raimy and Daniel have been thrown together a number of times now, even though he says he’s never been to her borough and there’s no one (because her mother’s gone) to tie the two together. Raimy calling his number at the end does smack of stalking, but it also just indicates her desire to just be in some sort of contact with him, since she’s lost their relationship completely. Thanks for the snack, Kyle, but we all know you’re just a placeholder at this point. Even if some things seem inevitable, we never stop fighting against them. We can see horrible things unfolding with a Trump presidency, but as tonight’s protests have shown, that doesn’t mean we’re going to take them lying down. Frank faintly comforting Julie with “we’re not gonna let anything happen to you” reminded me of myself telling my children over and over this morning that everything is going to be okay, even though I wasn’t sure I believed it. But that doesn’t mean I’m going to stop trying until that’s a reality. Like Frank and Raimy, with so much at stake, it’s impossible to give up. The Nightingale was so covered up in his fight with Frank, I couldn’t help but wonder if he was actually Satch? I mean, we really don’t have any other possible suspects who would resonate at all. Although that wouldn’t explain why he stopped killing people in the first timeline, where Frank still dies. Really, can you get more ’90s than bootleg CDs? Keep the faith and stay strong, everybody.